Shop the Thrifty Fashionista, run by Joslyn Slaughter and her mother, Jera, has been mobile since the beginning of September. The owners are still finding the best locations to park their boutique and best ways to target their demographic: people who know branded merchandise and appreciate the value of the items. So far, the boutique has sold in the downtown Hyde Park area, on Clark Street between Monroe and Adams, and up north on Lincoln Avenue near Racine. The mother-daughter team started off selling clothing in a brick-and-mortar store in Bronzeville for four years, from 2006 to 2010. After closing their first store, the two decided to give retail one more chance. 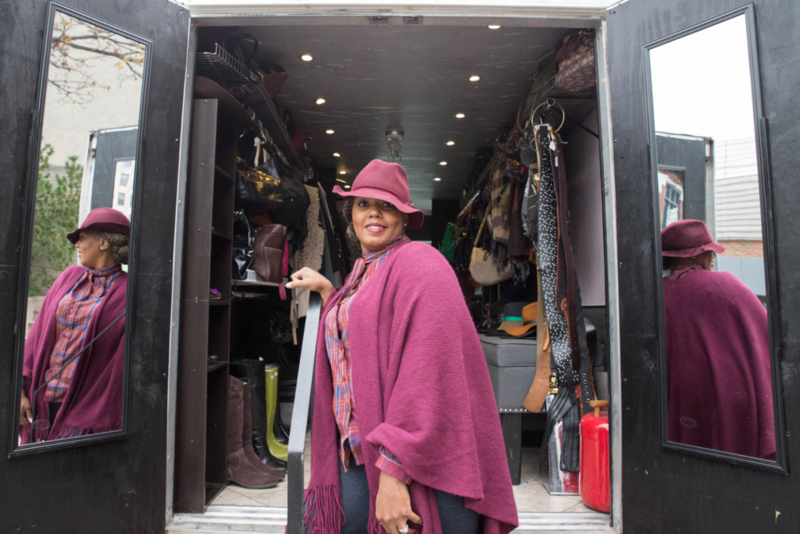 Joslyn landed on the idea of a mobile clothing store while watching a television special about fashion trucks in Los Angeles and New Orleans. Joslyn, who studied fashion at Chicago State University and Northern Illinois University, avidly follows trends and brands, and is in charge of collecting the merchandise. Shop the Thrifty Fashionista sells used designer items, which Joslyn finds by shopping at larger retailers, flea markets, and rummage sales. The company’s goal is to offer their customers the best merchandise possible at reasonable prices. But publicizing the boutique and getting people to fully understand what it is has been difficult. “Getting people to understand that it is a boutique on here and that you can actually shop on here [has been a challenge],” Joslyn said. Once people do step aboard the truck, however, she is able to explain how the truck works, as well as some of the advantages of resale. Joslyn hopes to counter people’s preconceived notions that resale stores and used clothing are “grimy” by talking sustainability: she emphasizes how buying used clothing is, by nature, more eco-friendly than buying new clothing. In addition to being open for walk-in retail, Shop the Thrifty Fashionista is available for private hire. Shop the Thrifty Fashionista is part of a larger parent company, J Fashion Enterprises, which Joslyn also started. In addition to women’s upscale resale, J Fashion Enterprises has a men’s upscale resale, and a girl’s upscale resale, Jordan’s Closets. They are also getting ready to launch a boy’s upscale resale. This is a great idea! I’ve lived in LA before and I’m very familiar with fashion trucks. It would be great to know how you can find the Thrifty Fashionista Truck. Is there social media contact where they post where you can find the truck each week? Just saw you & you’re pretty mama on WCL. Great idea!! You have some cute stuff?. Was wondering when and if you ever travel on Northwest Side Suburbs? I live in Des Plaines so was wondering if you will be traveling anytime in future this direction,?? Do you have a website as well? For people to buy stuff online? If so can you sign me up and send me your on line website? Have a great day hun. Happy Shopping? So excited really want to visit the fashion truck soon. I AM SO PROUD OF YOU LADIES I DON’T KNOW WHAT TO DO !!! This is So Wonderful !! Many Blessings on your Multi Ventures. Hope to meet you in the near future. What a fabulous idea! Especially for a girls’ night party–that is greatness! Love your desire to keep things stylish but affordable. Best of luck to you! Hello, do you have a list of dates of your locations? Also do you ever come further south of Hyde Park area?